Seven Chinese kidnapped in the volatile Iraqi town of Falluja have been released, according to the Chinese Xinhua news agency and the Arabic television station Al Jazeera. The station aired footage showing at least six of the men, one with a bandaged forehead, sitting in a room as a first secretary of the Chinese embassy in Iraq expressed thanks and joy at their release. Xinhua said two of the captives had been slightly injured in a traffic accident, but did not elaborate. 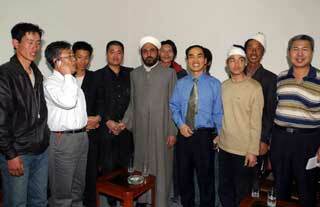 China's ambassador to Iraq, Sun Bigan, told Xinhua the hostages were all safe. Al Jazeera's footage also showed a cleric representing the Association of Islamic Clerics, Abdul-Salam al-Kubaisi, saying the detainees had been handed over to him at a mosque. Xinhua earlier quoted Chen Xianzhong, a Chinese merchant in Baghdad, as saying the association had taken care of the seven at a "secret place" after their release late Monday, Iraqi time. The seven men -- Xue Yougui, Lin Jinping, Li Guiwu, Li Guiping, Wei Weilong, Chen Xiaojin, and Lin Kongming -- entered Iraq from Jordan Sunday morning and were abducted in Falluja, west of Baghdad, Xinhua said earlier. They were from the southeastern coastal province of Fujian, the oldest 49 and the youngest 18. Xinhua did not say what they were doing in Iraq. Falluja lies on the main highway from Amman, the capital of Jordan, to Baghdad. A shaky truce between U.S. Marines and Sunni Muslim guerrillas was holding in Falluja Monday after further talks to calm Iraq's bloodiest fighting since Saddam's fall. The U.S. military said two U.S. soldiers and seven American contractors were missing in Iraq, where three Japanese are among foreigners being held by guerrillas. Eleven Russians working in Baghdad were reported to have been kidnapped after a shootout on Monday, and three Czech journalists were also reported missing. 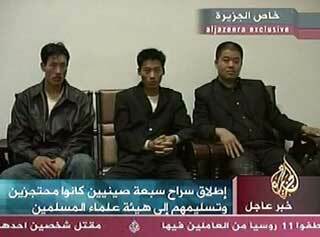 China's Foreign Ministry had called on Iraq's new interior minister to identify the kidnappers, locate the hostages and rescue them safely. It also issued a strong advisory urging Chinese citizens not to travel to Iraq. The People's Daily said Monday that many Chinese companies that returned to Iraq after the war had stepped up security. Newspapers showed pictures of armed Iraqi security guards on duty at a branch of the China Luzhou Petroleum Co in Iraq. China's exports to Iraq were $15.9 million in January, more than three times what they were a year earlier.